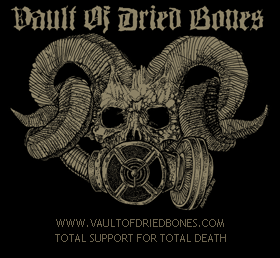 Serpentrance have joined the ranks at Vault Of Dried Bones and their baleful four song EP will be unleashed on cassette in the next few months. More information will unfold as the new material is recorded and as we are permitted to share it. Hail Russia’s death metal elite. This entry was posted in News and tagged aphotic, deathmetal, russia, serpentrance, temples. Bookmark the permalink.